Melt the butter in a large saute pan over medium-high heat. Add the pears and saute for about 5 minutes or until the pears are softened. Add the sugar and continue cooking until the pears are soft and the sauce is slightly caramelized, about 3 minutes. Add the ginger, cinnamon, orange juice and vanilla, and cook for another minute. Cover and keep warm. Combine the egg yolks, ricotta, sugar, orange zest and flour in a medium bowl. Whisk until well-combined. In a large bowl of an electric mixer, combine the egg whites and a pinch of salt. Beat on medium speed until the egg whites are stiff but not dry. Gently fold a third of the egg whites into the ricotta mixture. Fold in the remaining egg whites, making sure that no white streaks are left in the batter. To cook the pancakes, heat a large griddle or nonstick skillet over medium heat. Add 2 tablespoons of the butter. When melted, pour about 1/4 cup batter for each pancake onto griddle. Cook 2 to 3 minutes on each side or until lightly browned. Add more butter as necessary. 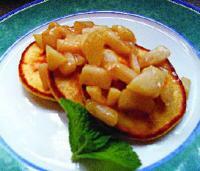 Serve the pancakes immediately with a large dollop of pear topping. Serve with warm maple syrup. To make this pancake breakfast extra-special, add some crisp bacon and fresh fruit juice.